Mathieu Bournival is passionate about helping families in Dufferin County develop individualized investment plans aimed at building and protecting their wealth. Mathieu leverages his experiences in the military service by taking a structured and disciplined approach to asset management, always ensuring the end goal is kept in mind with every decision. 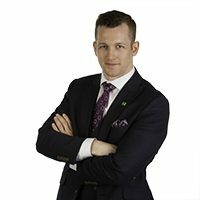 Before coming to TD Wealth, Mathieu was a top performing Commercial Analyst for TD; this experience taught Mathieu the importance of taking a conservative, risk averse approach to securities selection. Furthermore, as a former analyst, Mathieu is uniquely positioned to help entrepreneurs take full advantage of their business’ cash flow to maximize their investments and subsequent retirement planning. As an Advisor, Mathieu takes a multi-stepped approach to fully understanding and articulating a family's investment needs. Once clearly defined, a flexible financial plan is developed; and as situations and priorities change, so too does the plan, always ensuring the long term goals and kept in focus. Education remains a priority for Mathieu, having successfully completed the LLQP he is now working toward the completion of the Chartered Investment Manager (CIM) designation. Mathieu also plans to complete the Options and Derivatives licensing in the near future as it will help him serve his clients by providing them with the option for a more diversified investment approach.